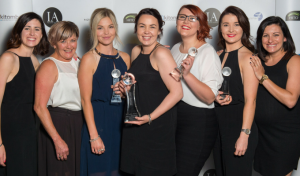 Wanganui salon, Protégé Hair, was announced as the 2015 New Zealand Salon of the Year at the Kitomba and New Zealand Association of Registered Hairdressers (NZARH) Business Awards. Named as a finalist in an impressive five categories, it’s no surprise Protégé Hair are the New Zealand Salon of the Year. They also went home as the winner of three additional awards – Employer of Choice, Evo Excellence in Marketing and Moroccanoil Boutique Salon of the year. Tom Murphy, CEO of Kitomba, commented on Protege’s success: “Congratulations to Protégé! They have been a powerhouse at the awards this year which is representative of their highly productive salon that has strong leadership, sound business practices and most importantly – passion”. The 10th annual Kitomba and NZARH Business Awards were held on November 22nd 2015, at Te Papa Museum, Wellington. The evening also marks the 6th time the awards have been celebrated together with the New Zealand Hair Industry Training Organisation (HITO) to create the Industry Awards. The awards recognise excellence in training and business in the New Zealand hair and beauty industries and were held in front of 250 guests. There was much to celebrate on Sunday evening as the hair dressing industry, worth a billion dollars per annum, is thriving and businesses using Kitomba have experienced great success during the 2015 third quarter. The industry has experienced a 3% increase in revenue and the average client spend is up at $95. Rebooking rates are up 2% and clients are more loyal than ever. In this award, judges are looking for an all-round stylist with clear passion for their business and industry. In this award, judges are looking for a business with sustainable practices that are an integrated part of their everyday business. In this award, judges are looking for a business that is in serious growth mode. Growth in revenue, client numbers, client spend and ultimately profitability. In this award, judges are looking for a clear workplace culture where staff feel nurtured, training is a priority and everyone wants to work for them. In this award, judges are looking for a business with a unique brand, that demonstrates planning, innovation, creativity and results. In this award, judges are looking for a salon design that perfectly balances function and form. From interior design to salon location and floor plan, it’s all about providing the right look and feel for your target market. This award is for salons with an annual turnover up to $600,000. In this award, judges are looking for a results-driven business with all-round strong KPIs. This award is for salons with an annual turnover exceeding $600,000. In this award, judges are looking for a results-driven business with all-round strong KPIs. In this award, judges are only looking at first-time Business Awards entrants and from these, the all-round strongest entry of all first time participants. This award goes to the top scoring salon from Grand and Boutique Salon, Excellence in Marketing and Employer of Choice.